Tops are part of an everyday wardrobe that you cannot go without. From crop tops to the iconic 70s style halter top, finding tops that easily fit into your wardrobe is simple with the right collection. Tops are made to cover the area from the waist to the neckline, but variations like a cute crochet crop top make it easy to take pretty pictures for Tumblr and go against the grain. 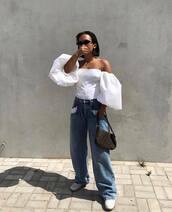 Try a trendy corset top to create a slim silhouette, or pair a striped top or a black crop top with your favorite skinny jeans and a beret for a Parisian-inspired look.